we do not need to defend ourselves before you in this matter. is able to deliver us from it, and he will deliver us from Your Majesty’s hand. We all know this story; we learned it at an early age in Vacation Bible School. Three young Hebrew men had grown up in Babylonian captivity under King Nebuchadnezzar. Hananiah, Mishael, and Azariah (we know them better by their Babylonian names Shadrach, Meshach and Abednego) faced a dilemma. Nebuchadnezzar was the most powerful man on earth at the time. He ruled the world from his kingdom in Babylon; he was a ruthless military commander, having never lost a battle; and his authority was supreme and unquestionable. Yet these three young Jewish men dared to thwart him. Nebuchadnezzar had erected a great statue of gold. It stood nearly 8 stories high and was overlaid in pure gold. The king commanded all the princes, governors, military leaders, judges, counselors and rulers of all his conquered lands to attend a dedication ceremony for this golden statue and to bow down and worship this false idol. They came in the thousands to the plain of Dura, and prepared to worship the false deity and religion. Furthermore, if you declined, it meant certain death. 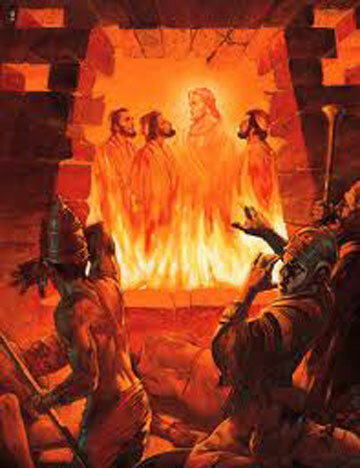 You would be thrown into the burning, fiery furnace. If you think about it, all conquering empires have to establish some kind of unification among their diverse territories. In Nebuchadnezzar's case, he demanded loyalty and worship of the golden idol as a means of subjugating everyone under his authority. He thought he could assimilate and control all his captured lands and peoples through forcing them to bow down to a common deity. The act of bowing down to the golden image accomplished two things for him .... political allegiance and forced worship. Only he didn't count on the conviction of our three young Hebrew men. In the midst of what must have been an agonizing trial for others, they didn't flinch. Their response was immediate and bold. They had no fear and their answer to the enraged King was borne out of steadfast faith. Although they had been educated in Babylon and given high positions within the government, they never forgot the God of their heritage. Jehovah was the only God to whom they owed their allegiance and to whom they would bow; even under the threat of a violent death. It is their example that I claim as my guide and my model for obedience. For you see, I think that this story has profound significance for us in these turbulent times. The 24-hour news cycle is on fire with stories of hate and religious persecution and frankly, the rise of Sharia Law. It doesn't take much for me to imagine there are those who would demand that we worship their god. Could you, (like Shadrach, Meshach and Abednego), refuse to worship another god? Even when threatened with the immediate loss of your life? Because that is exactly what the Bible tells us will happen when the Anti-Christ comes to power. Those whose loyalty lies with the Son of God, and who refuse to bow to "the abomination of desolation" in the Temple and who refuse his mark, will be killed. But there will be a remnant of Jews, just like Hananiah, Mishael, and Azariah, who refuse to bow. And the anger of Evil will spread to all believers. But like the three faithful men in today's Scripture, I know and trust that I will be delivered. It may not be in the way I would choose, but if it is God's will that I lay down my life while standing for Him, then I am ready. Either way, I am redeemed. Like our three heroes, I may not have time to contemplate an answer or a way out of the situation. I must know what my answer will be. And yet, I will not be alone as Matthew 10:19-20 tells us: But when they arrest you, do not worry about what to say or how to say it. At that time you will be given what to say, for it will not be you speaking, but the Spirit of your Father speaking through you. My purpose is not to frighten or panic you; it is to prepare you. None of us know the day or time when the Days of Evil will descend upon us, but this I do know: those who are not secure in their faith, or who don't know what they believe, will quickly give in, and bow down, when they are faced with difficulty and persecution. I hope that you will search your heart with firm conviction and resolve. When Evil demands your allegiance, will you remain faithful to our Lord Jesus Christ? No matter what the cost? Make your decision now and you, like the brave young men of our Scripture reading, will stand in triumph on that day. God Bless You and give you courage and strength! Thank you for speaking about this today. I appreciate it. My own feelings and thoughts are, I believe that those days are upon us and the "Days of Evil" are closer than many believers may want to believe. I agree, we have to be secure in our belief in our Savior now and what His promises are to us, no matter what situations will come our way. May we find strength through Him and our brothers and sisters in Christ as well as to help others come to know Him before it's too late. We ALL will have to decide for ourselves though when that time comes and I hope to be counted among those who stand for Christ our Lord. This life here is just a wisp of air and we, ourselves, nor man can save us, only Jesus and our life beyond this world with Him is forever and eternity.I choose Jesus, my Savior and Lord. I hope to always share the Gospel with others so that they can know Him and be able to share that glory that He has promised those who come to Him and believe in Him. There is strength, hope and help through Him for us in these times and tough times yet to come. Lisa, I hope your words will be taken to heart by those who read this blog. Each day, I ask God to help me decide what He wants us to know, and today, this familiar Bible story took on new meaning for me. It became so much clearer and, like you, I want as many people as possible to come to know Him. Thank you for such a heartfelt testimony ... may it open the eyes, the mind and the heart of someone who needs to hear your message.